Dig the new iPad Pro, but you don’t have $799+ to spend right now? No worries, Chinese brand, Chuwi has your back. The company is offering an alternative to the costly iPad Pro, which is available at one-fifth of the price. It’s called the Hi9 Plus and it’s a lightweight, slim tablet that boasts a body made of aluminum alloy. The product takes advantage of a 10.8-inch display that uses OGS full-laminated technology to reduce two pieces of glass of the original screen structure by one piece. The process has allowed Chuwi to reduce the whole weight and thickness of the device. In case you’re wondering, the Hi9 Plus tips the scales at only 500g compared to the 631g of the new 11-inch iPad Pro. The slate also has a profile of only 8.1mm. Even so, Chuwi managed to squeeze a larger 7,000 mAh capacity battery into the frame. According to the manufacturer, the juice box should be able to support up to 10 hours of video playback or 15 days in standby. The tablet is designed to serve you well in both productivity and entertainment scenarios alike. It features a spacious 10.8-inch IPS HD display with 2560 x 1600 resolution that also supports smart stylus input. The Chuwi Hi9 Plus is powered by a deca-core MediaTek Helio X27, backed up by 4GB of RAM and 64GB of internal storage. This means the slate is fast and should be able to handle anything you throw at it without breaking a sweat. You can use the Hi9 Plus for photography too if you want, as the tablet bundles an 8MP camera on the back and an 8MP selfie snapper. 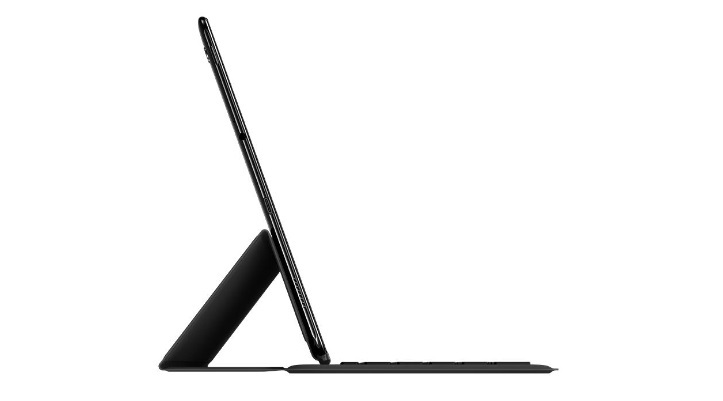 The tablet is also compatible with a foldable keyboard case for increased productivity, as well as protection. But it’s not clear at this point whether Chuwi offers the keyboard in the box with the tablet, or you’ll have to order it separately. Anyway, the Chuwi Hi9 Plus is currently part of the Aliexpress 11,11 promotion for Single’s Day which offers a 33% discount so that you can buy the tablet for $199.99.